I was listening to one of the Metatopia panelcasts from last year, and the panelists[*] mentioned that there are different types of feedback and wouldn’t it be nice to have a way to say what kind of feedback you wanted. Well, I agree, and it’s something I’ve been meaning to write about. So here goes. Before I start, let me say that when I send my games out for feedback (playtesting, normally) I always provide a list of specific questions. This is partly to ensure that specific things I’m wondering about get covered; it’s partly to avoid feedback I’ll find unhelpful; and it’s partly to provide a structure to help people think about the play experience. But anyway. Let’s talk through different kinds of feedback. Drafting feedback. This includes identifying spelling and grammar errors, as well as areas where language might not be as clear as it could be. You might want this when your game is in its final draft form. You probably won’t find it that useful before that point, because you’ll be redrafting anyway. Comprehension feedback. This is a bit like drafting feedback, but a bit higher level. It’s asking whether there are aspects of the rules that are confusing. Can you understand the game? This might be particularly useful for an early draft read-through. I normally check on it with playtesting as well. Experiential feedback. What did the game feel like to play? Was it humorous or scary? Was a particular mechanic hard work? Did you get emotionally invested in your character? This is generally a key component of playtesting for me. I want to create a game that feels a particular way, and so I need you to tell me what it felt like to play it. That’s much less useful if you’re just testing out a mechanic in isolation, though. You also might not need it so much if, say, you’ve already playtested the game quite a bit and you’re just testing a modification to the original design. Mechanical feedback. What happened, mechanically? Did you seem to crit fail constantly? Was there an exploit where you could build up unlimited bennies? Did some mechanics just never get used? Did anything break down at the table? You’ll probably want this sort of feedback at some point in playtesting, unless your game is super freeform. Some people like to playtest mechanics individually, outside the context of a full session. It’s not something I do, but worth considering. Design advice. It is often said that it is very annoying when people try to design your game for you through their feedback. And generally, I do agree with that. But, sometimes that may be exactly what you want: you know something isn’t working in your game, and you want suggestions on what to do about it. So, when you’re asking for feedback on your game, be clear which kind(s) of feedback you’re looking for and, where appropriate, which kinds you aren’t looking for. I would add that you can, and probably should, say which specific bits of your game you are asking for feedback on. If there’s a particular mechanic or aspect of play you want to hear about, say so! Even if there isn’t one particular aspect, you might want to break your game down into specific areas you want covered. Of course, it bears noting that you might not always realise that you need feedback on something. Maybe you think your mechanics are working perfectly and you don’t need feedback on them. If a playtest reveals they broke down completely, I’d hope my playtesters would tell me that, even if I was only asking for experiential feedback. I hope that’s useful. I’ve probably missed something. Comments welcome! [*] I don’t know exactly who said it. Panelists included Emily Care-Boss, Julia Ellingboe, Avonelle Wing, Shoshana Kessock and Amanda Valentine. I’ve collated the information from the first Lovecraftesque external playtest and I thought it might be useful to discuss it here. I’m not going to talk about our game, instead I’ll be talking about the playtest in more general terms, in the hopes of deriving some more general lessons about playtesting. We advertised the playtest through our website, Black Armada, and through G Plus, Twitter and Facebook. We put the files in a public drop box but only provided the link on request to people who expressed an interest in playtesting. 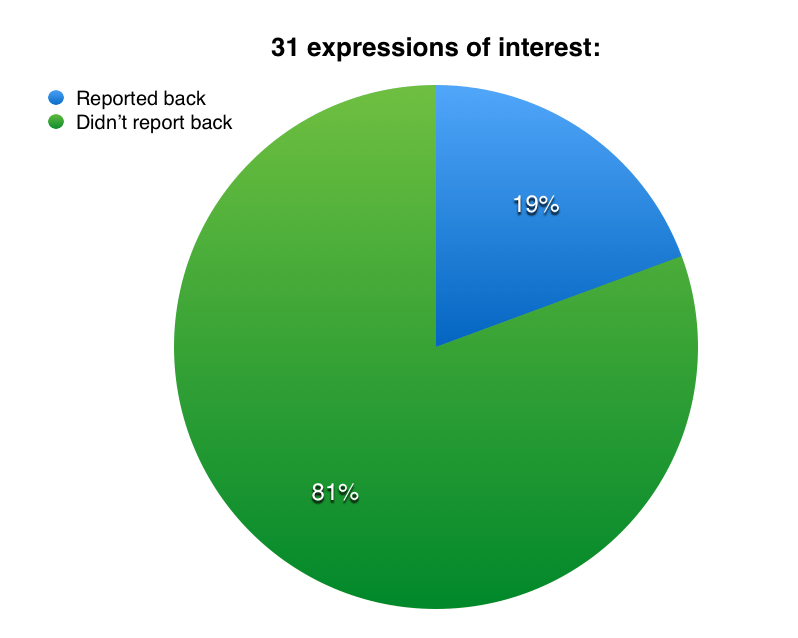 We received 31 expressions of interest. 29 of these were from people who appeared to be men, 2 from women. 6 were from people who we know quite well in real life, and another 3 from people we’ve met a few times in the flesh. The rest were from comparative strangers. We allowed six weeks for playtesting from the day we announced it. We sent a reminder out at the midway point to anyone who we hadn’t interacted with for at least a week, and another one a few days before the deadline. We received 6 playtest reports within the playtest period – just under a 20% response rate. All of these were submitted by men. 2 came from friends, 4 from comparative strangers. Between these we got 22 session-hours of playtesting, or 72 person-hours. It seems to me that we were fairly fortunate to get as many as we did. In previous playlists using a similar method I only had a 10% response rate, from a smaller number of expressions of interest. The improved success comes, I think, from a combination of us being better connected within the indie roleplaying community than I was back then, and having a game pitch that was always likely to be a bit more popular. None of the playtesters received any guidance from us or clarification. They were given a set of detailed questions covering 10 aspects of the game, which were rather bossily labelled “READ THIS FIRST”, in addition to the rulebook and some supporting materials. None of the playtests involved us, either as a participant or a witness. All six playtest reports responded to the questions we asked fairly assiduously. I wouldn’t say they were all completely comprehensive, but none of them ignored the structured questions, and all responded to most of the points we wanted covered. One came with a blow-by-blow actual play report (which was quite valuable beyond what our questions elicited). A critical issue is one which would make the game unplayable. A serious issue is one which would make the game not fun or prevent the design goals of the game from being realised. If even one group identified a serious issue, I’d count it. A major issue is one which makes the game very clunky or interferes with realising the design goals of the game. A minor issue is one which doesn’t interfere with the design goals or make the game avery clunky, but rather is a matter of polish. Minor rules clarifications also fall into this category. I’ve obviously had to exercise judgement as to whether an issue identified by a group is attributable to the design, and whether there’s anything that can be done in the design to ameliorate the issue. In one or two cases, because different groups reported radically different observations, I haven’t recorded an issue, but will instead watch for these recurring in the next round of playtesting. A note here about consistency: not all our issues were detected by all of our groups. Two groups (one of which played twice) did not pick up the serious issue identified above, and the two major issues were each picked up by only three of the six groups (arguably one of them was detectable in a fourth group, but I think we might have dismissed it based on their evidence alone, as it didn’t look that serious). 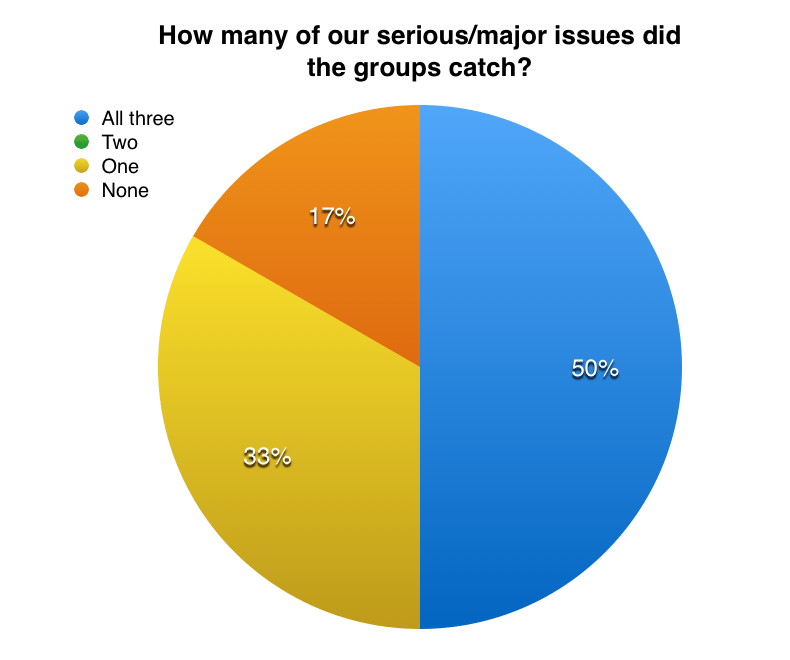 More importantly, these were clustered: 3 groups caught all the serious and major issues, 3 groups missed at least two of these issues. I want to be clear, by the way, that I don’t consider the above to be a poor reflection on any of our groups. I suspect the ones that missed issues did so because they were more familiar with the style of game or the genre. Some of our clearest and most helpful feedback came from groups that didn’t catch a lot of the bigger issues, but did notice many smaller ones. All the feedback was immensely useful. By the way, I haven’t analysed the minor issues, but my impression is that they were sprinkled liberally through all six groups. I doubt if there’s a single group that didn’t pick up some minor issues missed by the rest. The top line conclusion is that you need to playtest, and not just with one or two groups. The comparison with the playtesting on my previous game is instructive. I only had one response, which added a little to my own efforts at playtesting. But clearly, my analysis above means that there is a high risk of failing to catch even quite serious issues with such a low level of response. There would be innumerable smaller issues that will have slipped the net. Getting playtesters isn’t at all easy. I think we were fortunate this time around. Our voices carry a bit further as a result of a few years circulating in the online indie gaming community. We got support from a couple of people with a very wide reach, and although it’s hard to say how much impact this had, I would guess a lot. And our game concept was more grabby – though whether we would have been taken as seriously if we’d proposed such a concept three years ago, I can’t say. One thing I would observe is that it’s a lot easier to make playtests happen if you offer to organise them yourself. That’s pretty obvious, but it is worth saying anyway. You can tackle the tendency for the game to get cancelled by providing a venue, making sure you pick people you can rely on and above all not dropping out yourself. And you can make sure decent notes are taken and guarantee to take them away with you. It’s more effort, and if you want it to have the same value as an external test you’ll have to be disciplined about not facilitating the game itself, but it dramatically increases your sample size, which reduces the chances of missing a given issue.